The smiley new Volkswagen e-Up! Hatchback might be a bit unfortunately named (hey up! ), but it’s based on one of the most popular city cars around. It’s a lot like the standard VW Up!, except it’s quieter and cheaper to run. That said, it’s also a lot more expensive to buy and depreciates badly. Is it worth making the switch from petrol to electricity? OSV takes a closer look at what it’s all about with our 2018 Volkswagen e-Up! Hatchback review. The standard Up! 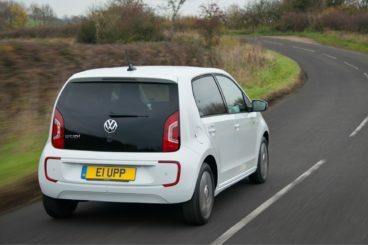 is one of the most entertaining and easygoing cars you can drive, and the e-Up! is much the same. It’s fun, nimble and quick off the mark. And despite shouldering 200kg more weight than the regular Up!, it feels nice and light. Most of the time, you won’t notice that extra weight. Its steering is precise, there isn’t too much body roll in bends, and overall it’s one of the most enjoyable cars in this sector. It feels fairly fast, even if its 0-62 time of 12.4 seconds makes it sound sluggish on paper. Power comes from a modest 81bhp electric motor, but keeping up with city traffic is a cinch. Clearly, it isn’t the most powerful car around, and accelerating hard will eat up its range quite quickly. Pushing it to its top speed of 80mph will also cause its 99-mile range to drop off fast, too. On the whole, the e-Up! drives a lot like the standard model, but there are differences. For one thing, this all-electric car is nearly silent. It also comes with regenerative braking, which slows the car’s motion to extend battery life. Remove your foot from the accelerator and you’ll lose speed and hardly need to use the brakes. This system offers five different driving modes – D, D1, D2, D2 and B. Choose any of the last 3 settings and the car operates the brake lights whenever you lift off. This acts as a handy warning to other drivers. It sounds like a complex system, but it’s actually super easy to get the hang of. The e-Up! is a lot more expensive to buy than the standard model, which explains why there’s a lot more standard kit inside. However, with the exception of the extra kit and the battery capacity readout, the electric variant is a lot like the standard Up! inside. 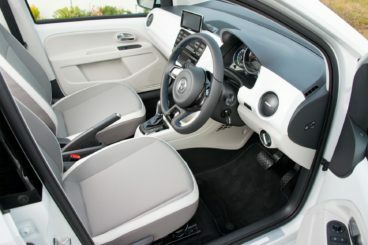 The steering wheel isn’t fully adjustable and can only adjust up and down, but it should still be relatively easy for the driver to get comfortable. The seat is supportive and offers lots of adjustability. The suspension setup irons out most niggles in the road, and passengers should be comfortable enough. Passengers will also notice how quiet the car is; not only is the electric motor nearly silent, but insulation is very good. As a matter of fact, the only sound you might notice is the car as it moves through the wind. Is the Volkswagen e-Up! practical? It’s just as usable as the standard model, and boasts the same dimensions. Its 251-litre boot is the same size, and it also comes with the same fairly high loading lip. This makes things a tad awkward but the rear seats can be folded totally flat, and doing so extends boot capacity to 951-litres. Other than that, it’s worth bearing in mind that the standard Up! isn’t what you’d call super practical. It’s going to be a tight squeeze in the rear and there’s strictly room for four people only on the one-piece rear bench. As mentioned, standard kit is good in the e-Up! – much better than in the conventional model. This electric variant gets whatever the standard model gets – cloth seats, black mirrors, door handles and radiator, a one-piece rear bench, front electric windows and a stereo system on a 3.1” screen. It also adds tinted rear glass, heated seats, climate control, power-adjustable door mirrors, sat nav, cruise control, a digital radio and interior chrome trim. Meanwhile, a multifunction steering wheel and a reversing camera are available as optional extras. In terms of how safe the car is, Volkswagen has a good reputation for producing safe vehicles. The e-Up! is yet another VW model that scored 5/5 when it was crash tested by Euro NCAP, and its standard safety kit includes ISOFIX child seat mounts, automatic emergency braking, a seatbelt reminder and electronic stability control. Always bear in mind when buying a car as small as this, however, that you’ll always come off second best if you collide with a bigger vehicle. Prices for the new car start out from £25,640. For more information on our leasing deals, check out our page here. In terms of its running costs, this is a zero-emissions car that has a BiK rating of 9% – the lowest there is. This makes it hugely appealing to company car users but it does have poor secondhand values. It’s much more expensive to buy than a regular city car, of course, but there’s no monthly battery lease cost involved. It’s also exempt from the London Congestion Charge. Volkswagen claim it can keep going for 99 miles on a single charge, and you can charge it from home for just a couple of quid. However, its range is time-of-year dependent, and it will drop off much quicker during the colder seasons (which is all the time in Britain?). It only produces 81bhp, but it’s responsive and well-suited to the demands of the city. It might be an electric car, but this is still just another stylish city car at heart. There are no monthly battery leasing costs, no road tax to pay and it’s cheap to charge. After three years of ownership, you’ll be lucky if you’ve held onto much of anything value-wise. The e-Up! is likely to lose two-thirds of its value. Its cost fares well against its rivals, but conventionally powered cars are so much cheaper. Let’s see how the car fares against its rivals in the comparison section of our 2018 Volkswagen e-Up! Hatchback review. The new Nissan Leaf is a stalwart of the electric car sector. As always, it represents excellent value for money and now boasts a lot more power and a much better driving range. Indeed, its electric motor now offers 148bhp, which dwarves the power output of the e-Up! If you want to cover 0-62 a lot faster than the e-Up!’s time of 12.4 seconds, the Leaf covers it in just 7.9 seconds. It’ll be like driving a hot hatch! Kinda. The Leaf is lively, easygoing, and its light steering works well in urban sprawls. The suspension is a bit firm for our liking, but it’s just part and parcel of the modern electric car setup. Nissan has equipped the 2018 Leaf with e-Pedal technology, which lets you drive the car using just the accelerator pedal. To recharge the batteries, the car deliberately slows down. It’s kinda like the Volkswagen’s regenerative braking tech. On the whole, the new Leaf is quieter and faster than last time, but it’s still not what you could call sporty. Running costs? The Nissan Leaf now has a driving range of 235 miles, which is double what it could previously manage, and almost triple what the e-Golf can manage on a single charge. However, 235 miles is a theoretical range and in colder weather you’ll struggle to get near it. Inside, Nissan has made a pretty eye-catching change. Where once a light cream coloured the interior, buyers now get treated to a conventional black interior. It smartens the cabin up a bit, but it’s now a lot less distinguishable from conventional cars. A flat-bottomed steering wheel is a nice touch, but there’s not much to get excited about. Design flair is lacking, and while the cabin is clearly well built, there is evidence of low quality plastics here and there. 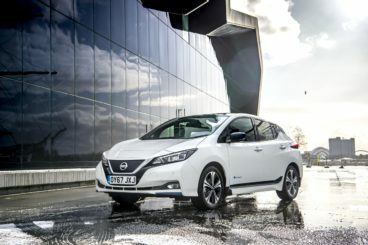 Is the Nissan Leaf practical? Its dimensions have grown and passengers have more room than last time. Five adults can squeeze in but four will be more comfortable, and while leg and headroom are decent, the raised seats mean knee room is compromised. Accessing the front and back seats is easy enough, while the 435-litre boot is a big positive. It’s much more accommodating than the VW, and indeed is one of the biggest boots in this sector. A premium-badged electric city car? Well, we never! The new BMW i3 is a smart-looking city car that’s fun to drive, cheap to run – but super expensive to buy. The i3 is easily one of the best cars of its type to drive. It’s fast out of the traps, handles tidily and is well suited to the towns and cities. It looks as unconventional as you’d expect an electric car to look, but it drives a lot like a regular BMW – which is great news. The raised driving position rewards you with excellent visibility, and it’s a cinch to weave in and out of traffic. 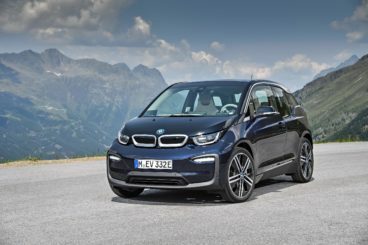 As usual with a BMW, the i3 benefits from a rear-wheel-drive layout, while regenerative braking means it’s possible to complete a drive without even touching the brake pedal. It’s weird but you’ll get used. The suspension is a bit harsh, but that’s par for the course with electric cars. However, BMW has fitted the car with skinny tyres that lack grip. Overall, the i3 has more driver appeal than the e-Up!, something that stability control and its larger tyres contribute to. In terms of its electric motor, the i3 delivers a good amount of power and can cover the 0-62 dash in just 7.3 seconds. That makes it the fastest car in this review, and a good 5.0 seconds quicker than the VW. Running costs? If you’ve always fancied owning a BMW but wanted to balance it with low-cost motoring, now’s your chance. This full-electric variant produces no CO2, and has a range of 195 miles. Inside, the most disappointing aspect of the i3 is its suspension setup. It’s on the firm side, and you and your passengers will feel lumps and bumps. Insulation is hit and miss – the electric motor is whisper quiet and so are external noises at low speeds, but at speed, tyre and wind noise picks up. Other than that, its cabin sports a futuristic look that will appeal to buyers who want something a bit different. A conventional car, this is not. The dash gets hi-tech screens, there are lashings of eucalyptus wood throughout the cabin, and overall this is a much more upmarket choice than the e-Up! Is the BMW i3 practical, though? It’s a small car but BMW has got as much as they could out of its dimensions. Anyone sat upfront certainly won’t be complaining about a lack of space, while head and legroom in the rear are decent. The car has a light and airy feel to it, but it’s strictly for four people only (there’s no middle seatbelt). The boot, meanwhile, measures 260-litres, which puts it on par with the e-Up! Both are embarrassed by the Nissan Leaf’s massive boot. This electric version of the dinky but super popular and trendy VW Up! is a winner in many ways, but also a bit of a disappointment in others. It’s essentially a more expensive, greener version of the Up! that’s aimed at buyers who want to go all-electric and reduce their carbon footprint while driving around in near silence. Those are the main benefits. Other than that, the new Volkswagen e-Up! Hatchback is as you were.